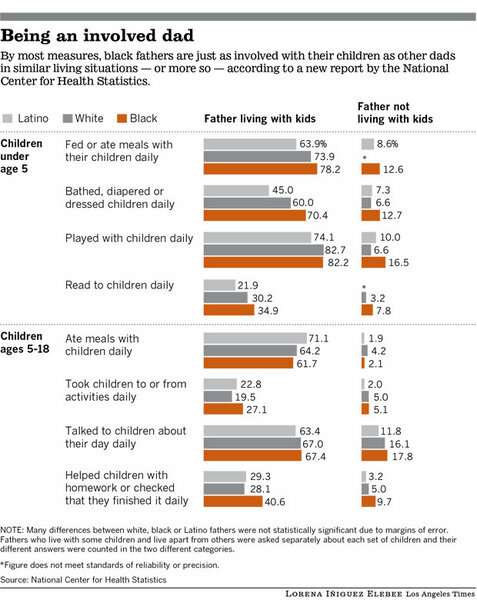 The Centers for Disease Control have released new data comparing the involvement of black, white, and Latino fathers. The study found more similarities than differences. Men of all races were more likely to be living with their children than not. Defying stereotypes, black fathers were, on average, more involved in their children’s daily care than white and Latino fathers. Image via the Los Angeles Times. It would be interesting to see trends over time, but for the past 30 years or so it seems to me that men in general strongly value the time they have with their kids and enjoy raising them. It was also good to read that the study affirms the importance a father has on childrearing. Disappointed to see this written here, without mentioning the fact that white people and black people can be Latin@s. They are not mutually exclusive, and it continues to ignore all the Afro-latin@s that exist. What type of Latin@s is this study referring to, cause that term covers a lot of ground. Something like 70% of black families do not have a father in the house, compared to about 25% of white families. So breaking down the data by this metric will obviously skew the results. For example, take the "eating meals" poll. I'll even assume that 0% of white fathers "not living with kids" have meals with their children daily, even though it's almost certainly higher. The total number of white fathers eating with their kids daily would be 75%*73.9% + 25%*0% = 55.4%. The total numbers of black fathers eating with their kids daily would be 30%*78.2% + 70%*12.6% = 32.3%. Of course, this fact runs in direct contrast to the point the study is attempting to make, so no mention of the actual reality.